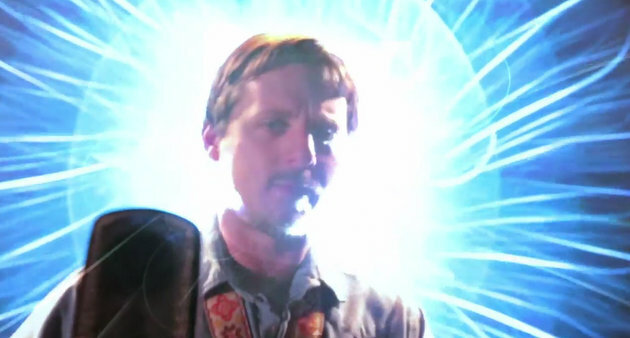 It was in a motel shower where Sturgill Simpson found the inspiration for what has gone on to become one of his most signature and iconic songs, and he almost injured himself rushing out of the shower to jot it down. This was one of the revelations that came out of a Q&A about songwriting that took place at the Grammy Museum in L.A. between Sturgill Simpson and John Prine on Tuesday evening (6-23). The method of writing “Turtles All The Way Down” came up in a discussion about the challenges of writing songs and finishing them. “Do you think looking back at the ones that did get finished are the ones that took about 20 minutes or 30 minutes?” Sturgill then asked Prine. Since including “Turtles All The Way Down” on his second album Metamodern Songs in Country Music, it has become the song many people identify Sturgill with the most. He says fans have given him all kinds of turtle mementos since cutting the song. “…and sing it for the rest of your life,” Sturgill added. 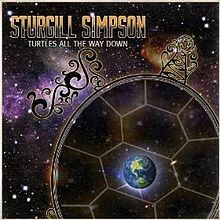 “Turtles All The Way Down” was a “hit” for Sturgill, and there’s a good chance he’ll still be asked to sing it 20 years from now. You can see the 1 1/2-hour discussion between John Prince, Sturgill Simpson, and moderator Paul Zollo below. Sturgill is currently touring behind his latest record, A Sailor’s Guide to Earth. I’m currently living in a hotel due to weird circumstances out of my control. Maybe I should start writing songs in the shower. I thought that’s what showers were for ? Makin up words and singin’ em …. I watched this whole thing. Really cool. I had seen somewhere that Sturgill would only participate if the emphasis on the music was all John Prine. Say what you will about Sturgill, he does have respect for the past and the greats. I think he has gained a lot of respect from the greats out there too. John Prine was so interesting. I didn’t realize he would be so funny. I saw an older bluegrass performer last year who was part of a Chicago bluegrass scene in the 1970s, who mentioned how funny John Prine was & also said that Liberace was a bluegrass fan who attended some of their shows. I wouldn’t have guessed that one. Another positive I’ll mention for Sturgill is that he often provides some history about the venues he plays. Kacey Musgraves also does a good job of that. The implication of my comment, taken with the fact that the song concerns itself with drugs, is that he was taking them in the shower or so high from taking them that he merely thought he was taking a shower, but actually wasn’t. Was my prose too dense or something? You still think that song is about drugs? It was a joke, don’t read too much into it. To be completely honest, I couldn’t care less what the song’s about. My sun doesn’t rise and set with Sturgill like so many others. In fact, he’s barely registered on my radar at all. I have all three of his albums and as far as I’m concerned, each one is weaker than the last: I casually enjoyed High Top Mountain, found Metamodern Sounds in Country Music to be okay, and regret wasting ten dollars on A Sailor’s Guide to Earth. I’m fairly certain I will not be buying anything else this guy puts out. I only commented because I thought the story sounded a little strange.